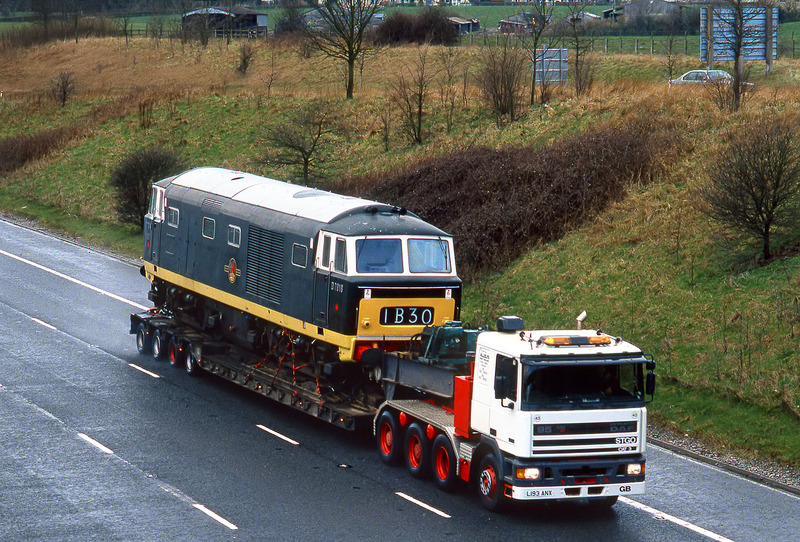 Leyland DAF power, instead of Maybach power! D7018 is in unfamiliar surroundings, as it travels along the M4 on 3 March 1994, en-route from its base at the West Somerset Railway, to the Mid Hants Railway, for their Diesel Gala. Whilst driving to Bristol, I saw this going the other way, so came off at Junction 18, and headed back from whence I had just come, overtaking the Hymek, before coming off at Junction 17 to wait for it to pass by. It turned into a much longer wait than I imagined, as the low loader obviously called in at Leigh Delamere services! Eventually it appeared, and is pictured here passing the Junction 17 slip road near Stanton St Quintin.